I have a love love relationship with food. I love it, period. Even when I eat too much, I hold no grudges. The ability to eat a lot comes in particularly handy in Danmark, whether it’s at a Julefrokost or just your typical Danish lunch. 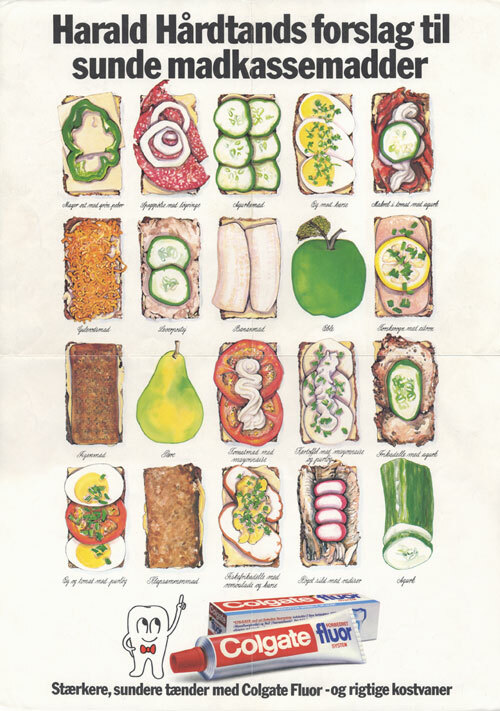 Because Danes like to eat, and they take it very seriously, as you can see by this poster of different Danish sandwich combinations. Mmmm, nothing like a banana and ryebread sandwich. This summer I visited my family in Danmark and checked off a good number of Harald’s suggestions. My Danish sandwich eating habits have drawn strange looks and complaints of fishy smells from my American friends and co-workers, but finally I was in the motherland where I could eat pickled herring with wild abandon and nobody complained about the wafting scent of mackerel. In case you’d like more insight into eating Danish sandwiches, you can follow my personal guide for a typical Saturday lunch. Then, more stuff, sans fish. And don’t forget you can add a round of cheese on white bread and crackers at the end! By now you should be full, and starting to plan your next meal. Tak for mad! HAHAHH, jeg kan huske de forskellige plakater fra min skole tandlæge da jeg var barn. Oh man! I need one of these posters also .. if anyone finds them let us know! I got the poster from my mom, so I don’t know if they’re for sale anywhere. I think the poster is originally from the 70’s? I might make my own poster rendition of “How to Eat Lunch Like a Dane”…stay tuned. Oh this makes me want to buy some thin rye bread right now. Leverpostej and thin slices of cucumber plz!